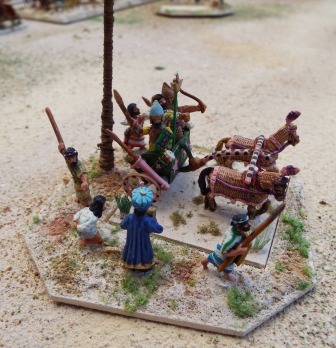 Inspired by the inscriptions showing the Egyptian battle against the invading Sea Peoples, showing the fighting around the ox-wagons, I have put together some units which consist of the wagons, baggage, livestock, slaves and families guarded by warriors. 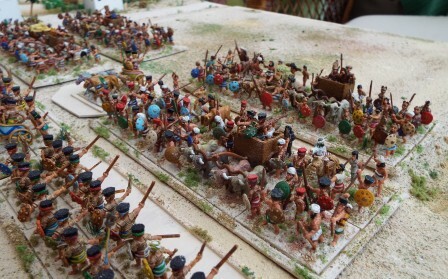 I’ve decided that I’m going to actually have a game with my biblical forces, using the Hail Caesar rules, so I’ve been working on some movement bases to make it easier to shift units, rather than have to move each base individually, and put the generals on more distinctive bases. I use mounting board which I get free from a frame shop in the form of offcuts they would otherwise bin. Eaxsy to do. Decide have many bases they are to carry in what formation, and cut the base, making the base 6mm longer and wider to provide room for 3mm edging strips. Allow a bit of extra space to allow for small variations in teh size of the bases, The cheap snap-off cutters from pound shops are great for this. Cut 3mm wide strips of the mounting board to edge each base, I use wood glue to stick these in place, and when dry I use a ruler and the cutter to cut a chamfer on each edge. I paint the edges with the same latex masonry paint I use for basing, apply the same scatters, and when it’s dry it’s good to go. 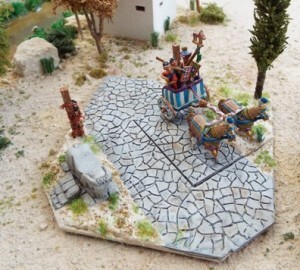 For the vignettes, I have created larger bases into which the Generals chariot base can be set, and tried to put other figures or items around the base which gives some flavour of the commander. The Syrian commander has a couple of bodyguards, a prisoner cowering before him, and a richly dressed supplicant making some offering. The Ahiyyawan (Mycenean or Minoan) has some bodyguards, together with a trumpeter to dispense commands. The Hittie king Mursilis, adorned with silly hat, has overseen the ritual march past of his army. It appears that they might have had a ritual where the army would march between 2 posts, each of which would be adorned with half of the body of a lucky individual who had been cut in half! Nice – although I’m told he was very good to his mother. I understand that wishy-washy liberal types frown on this sort of thing these days, so it’s probably not the done thing now. Further details are a bit lacking, so I have assumed that they were strapped to each post rather than just hung from them. I have also chosen to have the arms strapped to a pole as if they are pointing the way to the troops, all lashed on with a sacred scarlet rope. If that didn’t freak the troops out, I don’t know what would. History doesn’t record whether it did any good for the morale or led to better results, but I suspect the victim was a bit peeved. I have created a stone altar in the form of a bull, using Fimo putty. Bronze-age types were big on bulls, although the Egyptians seemed to be keen on lots of other animals as well. This is a larger base because Muwatallis was one of the Great kings of the time, rather than the jumped-up petty kings who only ruled a few cities at most. I intend to add to it, when I can find or convert a crazed knife-wielding priest, and I might add a few marchers to represent the tail end of the column. 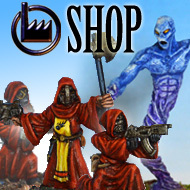 I have also painted a 100+ civilian types which I’ll use to adorn the city. The aim is to create a series of vignettes to create points of interest, but I am also working on some rules to represent invaders fighting their way through a city. 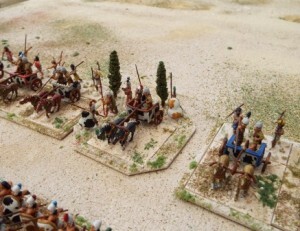 A bit board-gamey, but using bases of figures as counters. We’ll see if it come to anything, but I’ll post it here if it does.